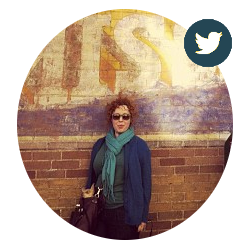 Last August I went to New Orleans for a celebratory post-(mid-life-)graduation trip. In addition to the above crank-inducing norms, I was pretty crabby from being scolded by the flight attendant when I put my luggage in the overhead compartment and from having to sit in 29 when my friends were up in 16 and 19. So naturally I was harshly criticizing—internally with damning soliloquy and externally with the facial expressions I can't help but make when I'm in this sort of mood—everyone who stepped onto the plane. And this one lady across the aisle was breaking a lot of my rules. And by "my rules" I mean "my correct opinions about how one should clothe and comport oneself." There was still a fair amount of ruckus going on—exasperated latecomers expressing relief at catching the plane, children whining and overhead doors slamming. Then, above all of the chaos rose an ostentatiously loud television cacophony complete with booming dialogue and laugh track. I looked across the aisle at this woman with piercing disdain and here is the worst part—she had headphones. Unplugged. Around her neck. I was lasciviously fantasizing about the scold-y flight attendant verbally lashing her, but within a few minutes we were all instructed to put away electronics and the scene ended. The plane took off and I took to temporarily projecting my disdain on the woman in front of me with the poopy pants kid. Twenty minutes after takeoff I looked over at the TV lady again to see what she was up to and hopefully indulge in some really first-rate harsh and silent criticism. Except she was happily watching her show the proper way: with headphones. The woman's face was beaming with delight. I mean she was just smiling. I was pretty committed to detesting her so I snuck a peek at her screen. I was really hoping for something to further endorse the judgment I had already passed. Something really debased and vile like Two and a Half Men or Saw VI (uhm yes my brain categorizes those things together). But she was watching The Andy Griffith Show. 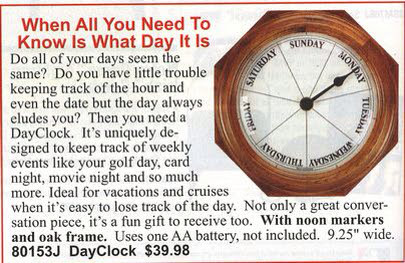 I let out a sigh, disappointed that the human race—though still capable of inventing, manufacturing and marketing a "day clock," which is a clock that doesn't tell you the time, only the day, and costs $39.98—hadn't completely left me hanging. After all, how can you stay mad at someone so sheerly delighted by watching Barney do something plum silly? This is a real gadget freak and their criteria is different in that rolex replica sale they are in the loop of latest technical developments and probably models. Their criteria is still as detailed as the replica watches sale overt customer and in fact can even be more stringent due to the tangibility of the features and functions desired. However it makes their replica watches decision far more ablack and whites. This person could be a diver, an athlete, traveller, someone with a real passion for the outdoors and living life to the breitling replica full. In this modern era, many customers are now crossing paths and looking at more than one criteria. This makes the replica watches uk decision making process far more complex. Nature has prevailed and we are in a time where people want it all and have become more demanding. This has made fake rolex sale manufacturers take stock and conceptually design models that are both visually and functionally appealing.